Another great race at Shatton today for the Wolf Pit Fell race, the first of the Accelerate Gritstone series. A bright sun and glorious clear skies meant it looked like near perfect race conditions. At least until runners stepped out of their cars to be met with a chilling wind which had caused the collapse of the race HQ marquee overnight. 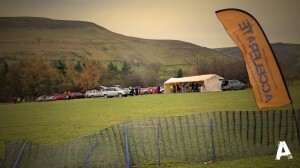 All was restored in time for the registration opening, the numbers running kept the registration tent busy right up until the start with a long queue of runners in various stages of winter kit stood waiting in the wind. with a briefing from the race organisers and a quick random kit check lottery conducted it was to the start with the assembled field spread out across the start line and a fast jostling start down the field to the stream crossing on the road . The tarmac soon ended and it was into the beginning of the near 600′ climb over the first mile to Shatton lane. It was hands on knees time for most by the time the lane was reached and then a short section of rocky track running until the route looped round onto Abney Moor and a section of fast flowing dry underfoot singletrack . Perfect running! This led to the first descent and some fast downhill running towards Offerton Hall and then steady climb back towards the transmitter. This is a race with a sting in the tail though and the unprepared might have thought this was the end of the climbing. Not to be ,as a quick downhill section on the road leads back to a steep climb back towards the lane and the transmitter. From here it was the final plunge back down the way we had come with the dry grassy slopes making for some seriously fast running back to the road and then into the finish field and a hard push on aching legs into a strong headwind that meant sprint finishes were even tougher than usual. There was some excellent running with plenty of Dark Peak vests at the finish early on and Simon Bailey of Mercia finishing first with a time of 37.58. For me it was a tough race , my usual unintentional race strategy of passing lots of people on the climbs only to have plenty of them hurtle past me on the descents worked as well as it usually does..I was pleased with my time, well over three minutes faster than when i first ran this in 2012. If i work on my downhill technique i might shave a couple more minutes off next time! It was a great race to start the season.Thanks to the organisers & marshals and the 338 runners who ran.